Marsha had a difficult time hiding her feelings from the rest of the group during her recent confrontation with Pete and Jeffrey. Marsha was excited to share her ideas with the rest of her team but became frustrated when she felt Pete and Jeffrey were too critical. Marsha felt like her creativity was being questioned by their negative comments. Her enthusiasm turned to frustration, and she defended her ideas strongly. Jeffrey’s name calling felt personal, and Marsha left the conference room in tears. How does Marsha handle conflict? Marsha, like Jeffrey, handles conflict head on. Because Marsha and other “i styles” are naturally fast-paced, they are enthusiastic and passionate during discussions and may monopolize the conversation. The i personality is known for being open with their feelings but can become overly expressive and emotional during arguments. They can also become flustered and disorganized if they feel they are being bombarded. The emotion that “i styles” bring to the table can make their colleagues feel very uncomfortable. Marsha and other high i’s are often seen as overly emotional or dramatic. Their colleagues may view them as high maintenance and try to avoid confrontations with them altogether. What can Marsha do to improve? Those with an i personality bring creativity, enthusiasm and positive energy to any team but need to be able to accept criticism in order to take their ideas to the next level. Marsha should first and foremost slow down during arguments and really focus in on what her colleagues are saying. 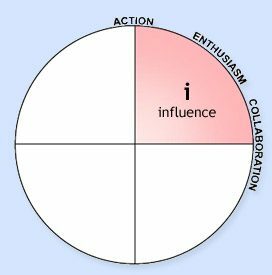 High i’s can be much more effective if they remain objective during discussions and eliminate the emotional influence. Join us for our next blog post in which we dive into the “S” style and how they handle conflict with others.